In celebration of Community Banking Month this April, we are profiling some of our community banking members and their local business clients! According to the Institute of Local Self-Reliance, banking with a community bank or credit union means huge benefits for the local community, small businesses "depend heavily on small, local banks for financing. Although small and mid-sized banks control less than one-quarter of all bank assets, they account for more than half of all small business lending." This is why Danzeisen Dairy decided to seek out a local bank when they were looking for financing options to launch their business. They understood that by financing their loan through a local bank, that the money they paid the bank would be returned to the local economy in a similar fashion to help other local businesses get off the ground. The love goes both ways as local banks appreciate being able to support the efforts of other local businesses rooted in the community. “We are grateful for the introduction to Danzeisen Dairy through Local First. 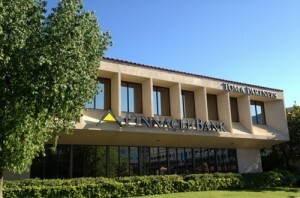 The opportunity to provide financing for a local, family owned and operated business made great sense for our community bank,” said Jared Shintaku of Pinnacle Bank. If you are a business owner and are interested in financing options with a local bank or credit union, join us for our meet and greet with representatives from local banks and credit unions on Wednesday, April 29! Click here for more info.